Revisiting our American architectural traditions, this stately arbor is enhanced by keystoned, arched side panels. 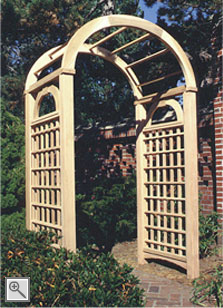 The side panels in this arbor are constructed of a triple-layer lattice. The vertical 1½" pieces are sandwiched by ¾" wide horizontals, creating an interesting pattern. Available with or without the Williamsburg Extensions and the Williamsburg Moon Gate, as shown here, or with any of our other gate styles, as referenced in the Arbor Gates and Extensions section. 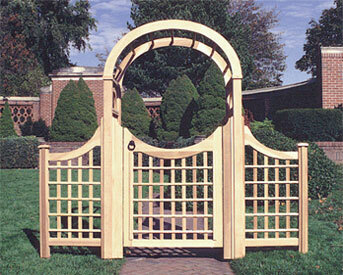 The arbor is also available with a Double Williamsburg Moon Gate when the opening is increased to a 5' width. See the Rockport Double Moon Gate for a reference. With 4" x 4" posts and 36" deep sides our Williamsburg Arbor remains a perennial favorite. The opening for this arbor may be customized to any size up to 5'.